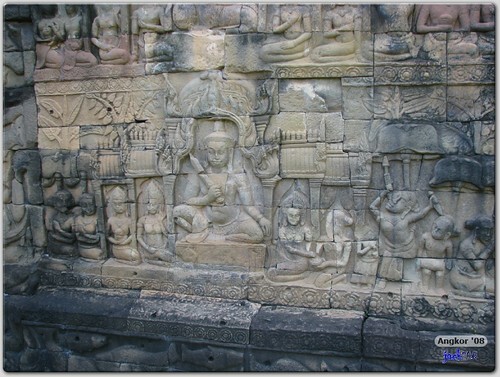 As with almost all temples or buildings erected by Jayavarman VII, they were usually equipped with dramatic bas relief. 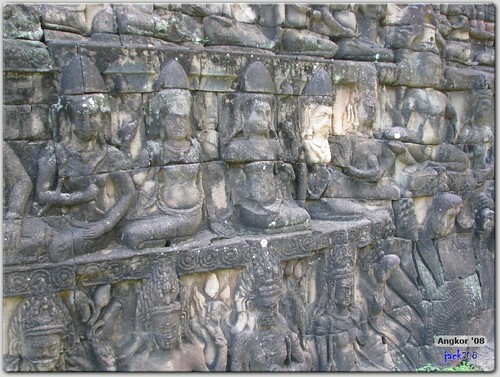 The Terrace of the Leper King is no exception except the bas reliefs here tend to be of the mythical variety (unlike the Bayon which depicted normal every-day lives of the Khmer people). 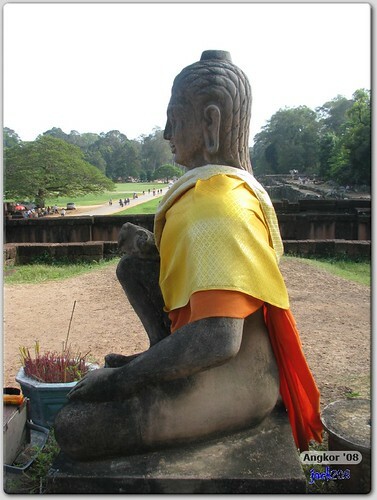 The namesake for this site – Leper King – is derived from the statue of Yama, God of the Underworld (Hindu God of Death) which sits on the platform of this terrace overlooking into the Royal Square. 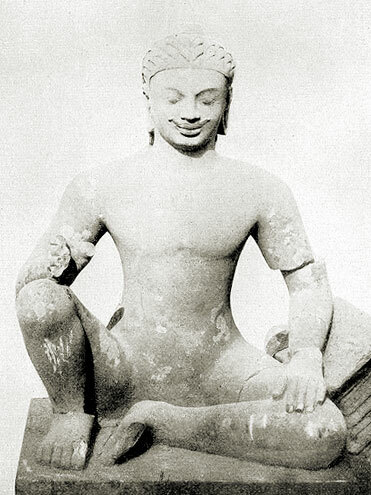 The God of the Underworld sits naked, with his right knee raised (Javanese style) and carries a mace in his right hand – though in the statue we saw, the right hand was cut off and we can’t confirm if it carried a mace. God of the Underworld sitting on the terrace platform overlooking the Royal Square. 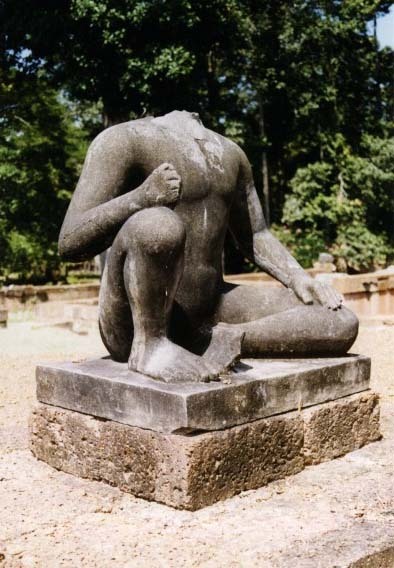 The God of the Underworld is depicted as a male figure, but he has no sexual organ (see picture above). He’s also usually naked and I suspect the statue we saw at the terrace was covered with a golden yellow robe for modesty purpose? 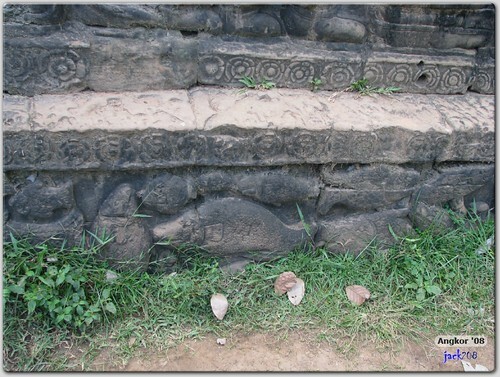 In the background is the Terrace of Elephants. How was the God of Death linked to “Leper King” no one knows. There are two stories going around. Firstly, the corrosion on the statue due to lichen giving it an appearance of leprosy probably resulted in people thinking this was a statue of a leper king. 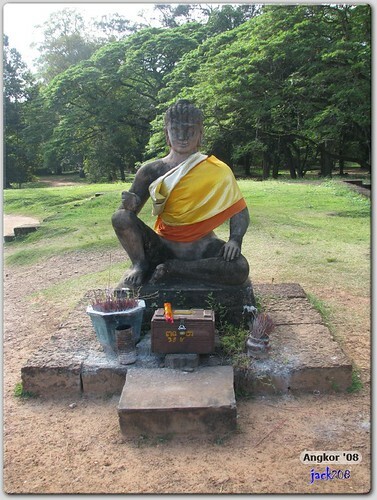 Secondly, many held a theory that King Jayavarman VII himself was a leper – though there was no hospital records to confirm it – and a few even suggested earlier kings were lepers too. 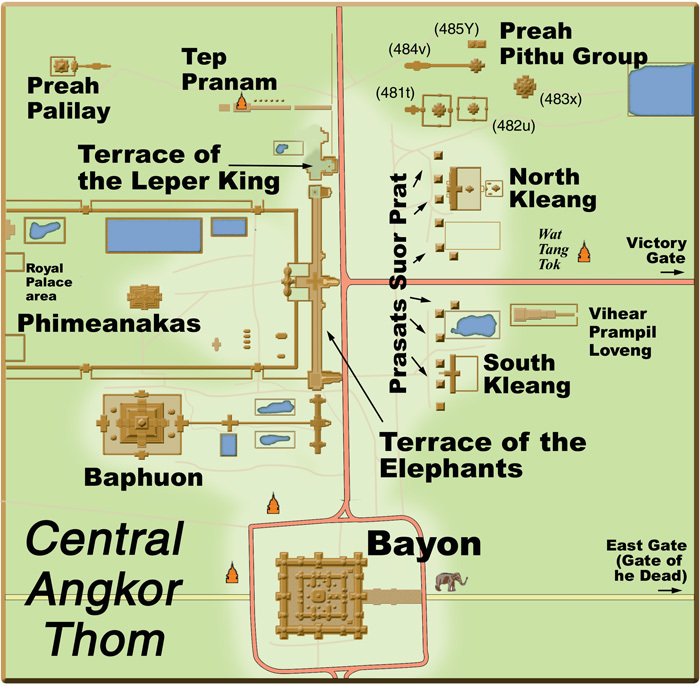 There’s also a widely-held belief that the remains of kings of the Khmer empire were deposited here, in the terrace of the God of the Death so this terrace then becomes a sort of mausoleum for the kings. However the statue we saw at the terrace is merely a replica copy of the original, which is now being kept at the National Museum (Phnom Penh) for fear of theft and vandalism. They even hacked off the head of the replica once! Even the replica copy of the Leper King were not spared from theft – it’s head was hacked off probably to be sold as antique. Note: Some has suggested the statue of the Leper King was designed based on an amalgamation of King Jayavarman VII and Buddha, hence giving rise to the giant Smiling Faces found in the Bayon. This young boy (above) followed us from the Terrace of Elephants, and continued to give us some useful running commentary on the places and sites we were visiting. He left us only when we got to Tep Pranam. We managed to complete the Terrace of the Leper King in 15 min. 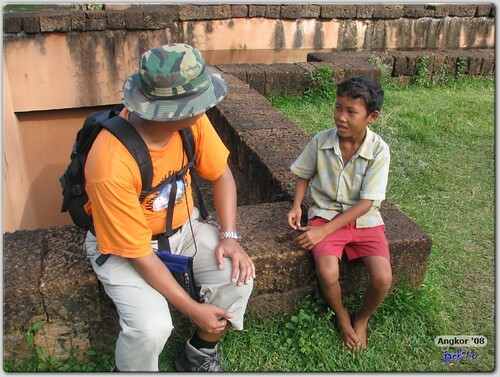 This gave us hope that we can indeed complete the other two nearby sites – Tep Pranam and Preah Palilay – within the next 30 min. 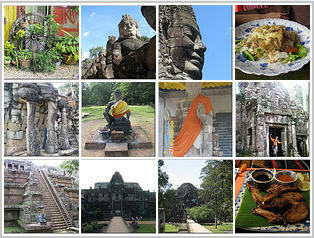 Stay tuned for the visits to Tep Pranam and Preah Palilay in the next Angkor ’08 trip – Day One of Temple Visits blog.